The new year marks the 10th anniversary of the Aranui III (www.Aranui.com) plying the waters of exotic French Polynesia with an itinerary that includes Tahiti and the remote Marquesas and Tuamotu Islands. The Aranui III is a well-appointed passenger-cargo vessel that offers 17 departures of the two-week cruise with rates starting at $2,346 per person, based on double occupancy. In celebration of the 10th anniversary, the Aranui III will change the itinerary of its March 16 sailing by combining visits to Puamau and Atuona on Hiva-Oa to one day on March 21 and adding a stop in Bora Bora on March 28. In Puamau, travelers will visit an archeological site followed by lunch and a visit of Paul Gauguin’s grave and the village in Atuona. The visit to Bora Bora includes a picnic on the white sand beach of Motu, a private island, highlighted by roasted pig, shellfish curry and pumpkin pie, snorkeling and swimming with the sting rays. The Aranui III departs from the Tahitian city of Papeete on a regularly scheduled 14-day journey. Travelers can take advantage of a special 10% discount offered on select sailings throughout the year including a “Spring Discount” for the Feb. 23 sailing, a “Promotional Discount” for the April 6 itinerary, a “Pre-Summer Discount” for the June 8 sailing and a “Senior Special” for the Aug. 31 itinerary. Travelers will board the Aranui III for a “Freighter to Paradise” complete vacation experience through 800 miles of the most spectacular and remote islands in exotic French Polynesia including Tahiti, the Tuamotu Islands and Marquesas Islands. Travelers booking a stay aboard the Aranui III can choose from four different cabin categories – Suite, Deluxe, Standard and Class C – each providing different room configurations. The Suites are large outside cabins (some with a balcony) featuring a queen-size bed, refrigerator and private bathroom facilities with a bathtub. Rates for a suite start at $5,331 per person. The Deluxe rooms are large outside cabins designed with a queen-size bed, refrigerator and private bathroom facilities with a bathtub. Rates for the deluxe option start at $4,879 per person. The Standard rooms are outside cabins with two lower berths and private bathroom facilities. Prices for the standard room start $4,018 per person. The Class C option is described as a dormitory style room with upper and lower berths, air conditioning but without private bathroom facilities. Prices start at $2,346 per person. All rates quoted are per person and do not include port tax, cruise tax and tourism tax, which may total up to $350 depending on stateroom category, as well as a fuel surcharge of $100 per person. The cruise includes three meals with complimentary wine daily, guided excursions outlined in the itinerary, picnic and meals on shore. Optional excursions such as scuba diving and fishing are additional. 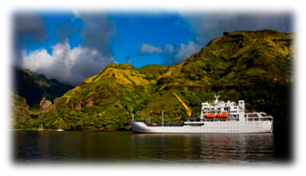 For more information or to book an Aranui III vacation, call 800-972-7268 or visit http://www.aranui.com.